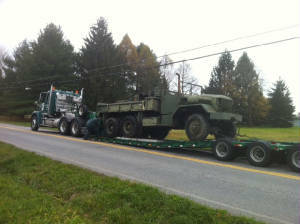 1969 M54A2C "5 ton dropside cargo"
The M54A2C that we have was built by the Kaiser Jeep Corperation. 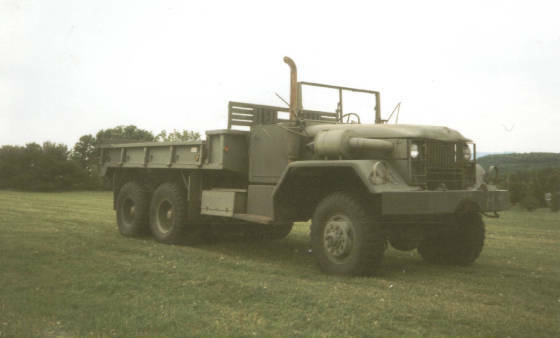 The M54 was a 6x6 truck that was made to carry heavier loads than the M35. 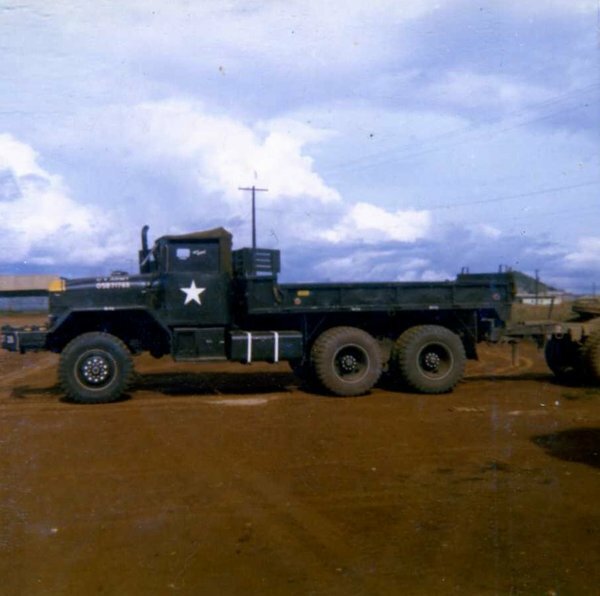 In Vietnam, many of these trucks were used in units to help carries supplies to foreward bases. During the war, one of the problems found was it took longer to load and unload trucks by forklift. So designers created a "drop side" cargo box so forklifts could load from all 3 sides. The museum has one of these trucks. "One of our trucks that saw a little to much action. The driver (name unknown) was wounded and sent home to Puerto Rico and his truck "Cecilia" (his girlfriend) was towed to our compound and used for replacement parts. We were out of Duc Pho and this particular run was to Sa Huynh. 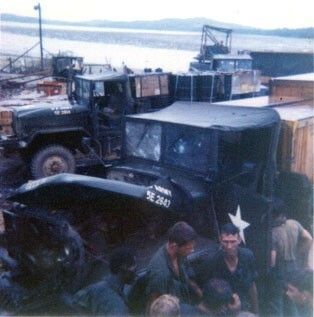 When I arrived with the 63rd tc, our outfit used to make regular runs down to Sa Huynh to be loaded up by the Navy and then haul supplies back to Duc Pho. At the time 68-69 we never had any kind of convoy as we would run down the road independantly and on our own. That all ended when Charlie finally started to figure out that we were pretty much sitting ducks while running on our own. "Cecilia" was running back from Sa Huynh under a full load when several of the enemy stepped out in front of her and fired a RPG into the radiator bringing her to a abrupt stop. 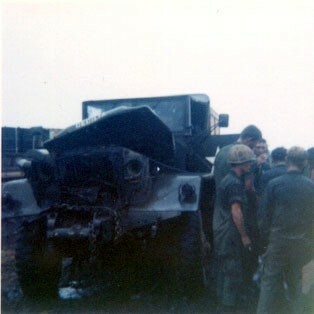 The driver saw the enemy crouch down to fire his weapon and slammed on the brakes and dropped down on the floorboard as the rocket hit his truck. Upon stopping he jumped back up grabbing his weapon, but was surrounded by Charlie there on the road. When they saw him with his weapon in hand they open fired striking the drivers side door with many rounds of rifle fire and wounded the driver in the legs. About the same time another driver from our company who was comming up from behind saw what was taking place, roared up at high speed, slamming on his brakes and sliding his truck crossways in the road and jumped out and set up heavy fire from his M-16 to the enemy who disapeared into the brush along side the road. The driver was air lifted out due to his wounds and pretty much after that day on we ran in convoys to and from with no stragglers allowed." Jim James 63rd Trans. Co.
Our M-54A2 is still awaiting restoration after its purchase in 2002. More to come in 2013 on this one so check back with us!! !